This dinner was very much invented as I went along. I didn’t want to have to buy anything extra, which would have meant driving to town, so I had to work with what was in the cupboards. I decided on a simple tomato sauce, having tasted some lovely ones in Italy, and pasta. Then I decided that just the bacon in the focaccia wasn’t protein enough for me and went on the hunt for some meat. I came up with half a forgotten bag of Ikea meatballs. I love Ikea meatballs! No matter what I do I can never seem to make Swedish Meatballs any where near as good as the Ikea ones. I’ve run out now so an Ikea trip is in my future! The recipe is for the tomato sauce alone, just serve over pasta and any meatballs of your choosing or just with pasta if you want something simpler. The day I perfect my Swedish meatballs you can guarantee I’ll post it here! – Melt the butter in a deep pan with a small splash of oil to stop it burning. – Add the garlic and stir until just starting to brown. 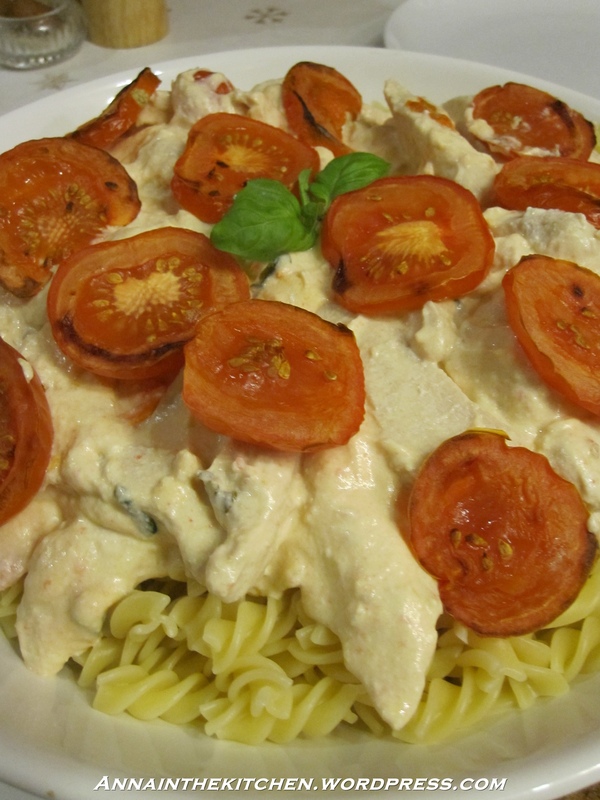 – Add the tinned tomatoes, the tomato puree, sugar, salt and pepper and stir well. – Bring to the boil and simmer gently for at least 30 minutes, preferably longer until the sauce is reduced and quite thick. – Add the shredded basil leaved 15 minutes before serving and stir through. *Use your own judgement when flavouring things, these tomatoes needed the extra sugar but yours may not, always taste first. If something just isn’t quite right then I find what’s usually called for is a small pinch of salt as in this case. I have another tomato sauce recipe that is a lot chunkier and just differently flavoured here. I like both equally but this one is perhaps closer to the bog standard Italian tomato sauce you get over there.